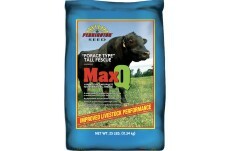 Pennington Max Q Forage Tall Fescue 25 lb. Max Q enhanced tall fescue provides excellent permanent pasture for all classes of grazing livestock including cattle, sheep and horses. With adequate soil moisture, it provides high quality, abundant forage throughout the fall months into spring and early summer. The highest productivity is September-December and March-June. When cut in the early boot stage of maturity, Max Q produces excellent quality hay. Excellent for fall stockpiling and managed grazing during the winter months.